When the first leaked pictures came out for the new A7 mark II, I was excited. As a designer, having spent a better part of my life designing to make things easier for people to interact, I wanted to focus this review on design - after all the devil is in the details. 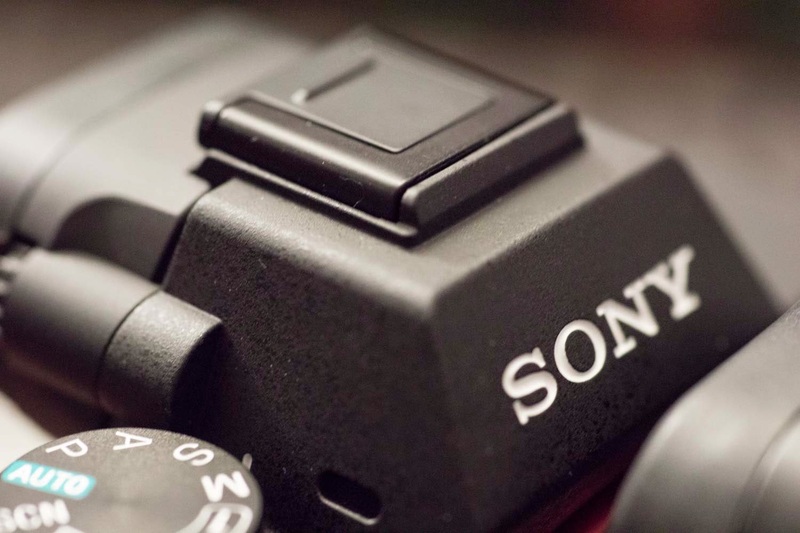 Mirrorless cameras are still relatively young and going up against the decades of design refinements in SLR cameras is something where this segment is playing catch up with. 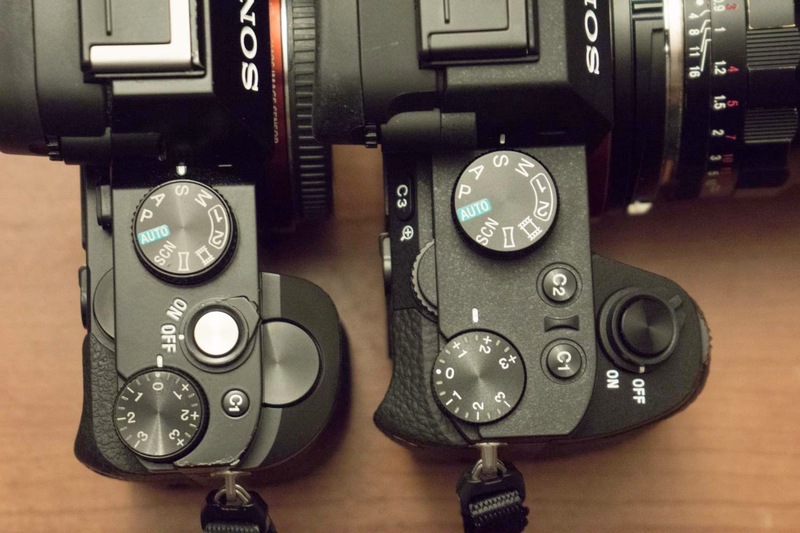 Mirrorless cameras are not just free of the bulky mirror box, but overall smaller. 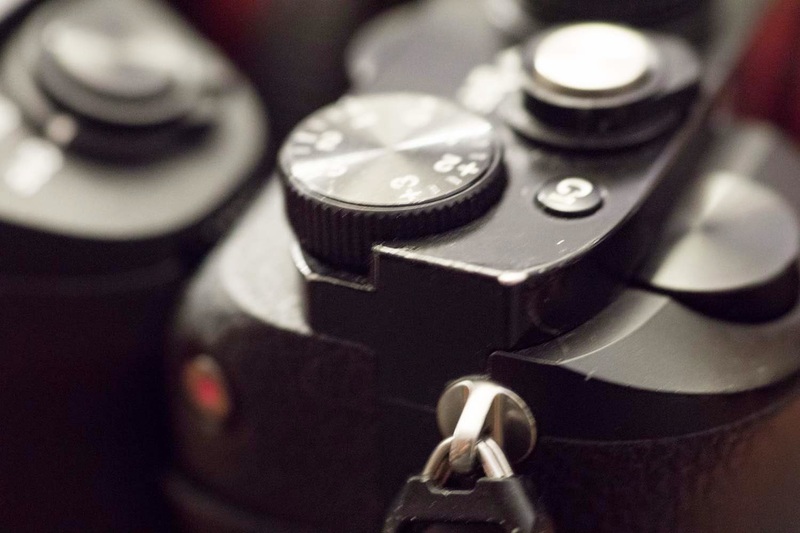 With the smaller sizes, it contends with the balance of being too small vs the functions that makes SLR cameras great. 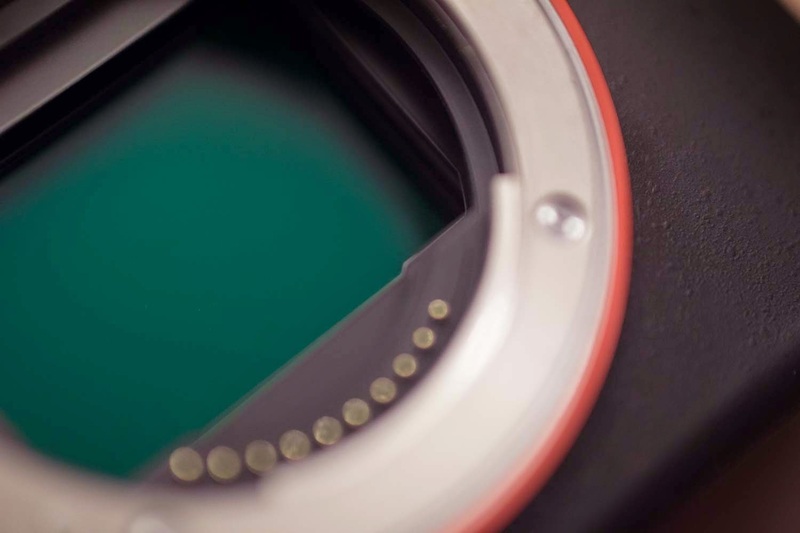 Most modern cameras have all the features that are expected by consumers, and for the most part are on par with each other for quality and function. But one of the more important factors of making a tool work well is how easy it is to hold, handle and utilize the features. 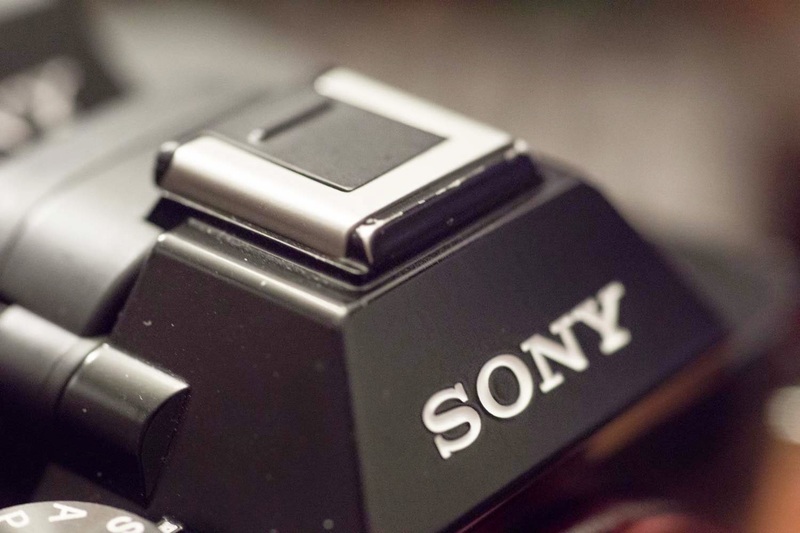 The new Sony A7 mark II is not only heavier but also slightly taller and much thicker. All of these are to incorporate the new 5 axis In Body Stabilization System (IBIS). The extra heft is noticeable and for some who are looking for a balance between size and weight, this may be more than they expected. I personally find it more solid feeling in the hand and comparing it to my brass constructed Leica M2 (580g) is pretty equal. But I do know wearing a thin profile neck strap with this kind of weight isn't all that comfortable after a couple of hours. Invest in a much thicker and comfortable strap if you intend on wearing it around the neck. Most of the upgrades are pretty subtle at first, but the more you delve into it, the more you realize the importance of each update. The headline ergonomic update was the grip design. The grip now reflects a more traditional SLR like design approach (Nikon-esq to be specific). The big move was relocating the shutter button to the more logical place on top of the bevel of the grip from the top plate location. Some people have had some concerns of the depth and comfort of the grip, but much of this is subjective and hard to make it well suited for each and every user out there. The deeper grip certainly changes how it's handled and the location of the fingers change. It's a bit subjective for some how this works. The deeper and thinner grip means your fingers are more bent to hold it. For some this might be more troublesome and cause some cramping. The older grip feels more like a ball in the hand. But the differences change once you start to handle it with a larger lenses attached to it. I tend to dangle lens downwards and this style of grip works much better. The middle finger notch on the A7 is better suited for larger hands (I wear large gloves, but have medium sized hands). The introduction of the front wheel to the grip for some forces the fingers to go lower and clustered together. In fact for some it means the pinky finger either sits under the grip, or against the edge. 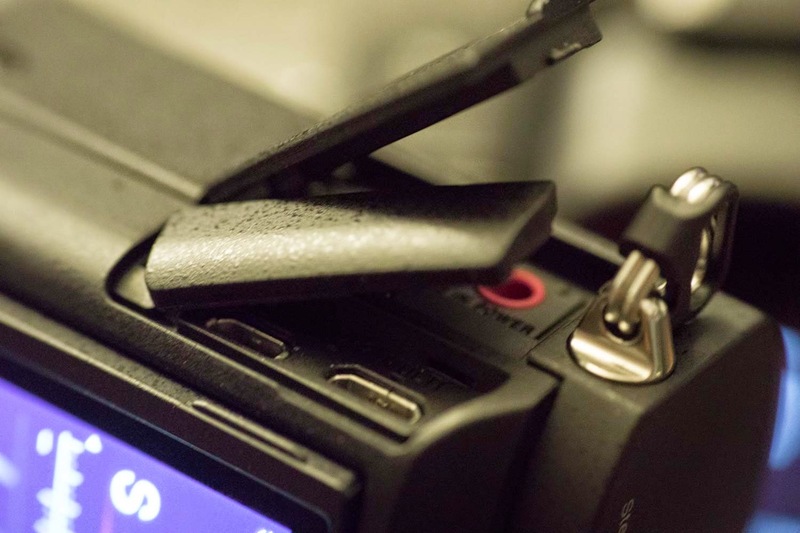 It can be uncomfortable, but easily remedied with a form fitting L bracket or the future battery grip. This could have also been easily remedied by not having such a large bump out below the front dial, but obviously there were some compromises made to ensure it was secure. In fact the front dial is slightly recessed or protected by a little bit of a shoulder. This in theory should protect it from being rubbed out of position. Some people have mentioned that this dial changes too easily. I suspect that this is caused by using a tripod sling strap system like the Rapid straps that hang the camera's upside down, and the dial against your clothing or leg. The slight bump out and recessed dial is probably not enough to protect it from changing. 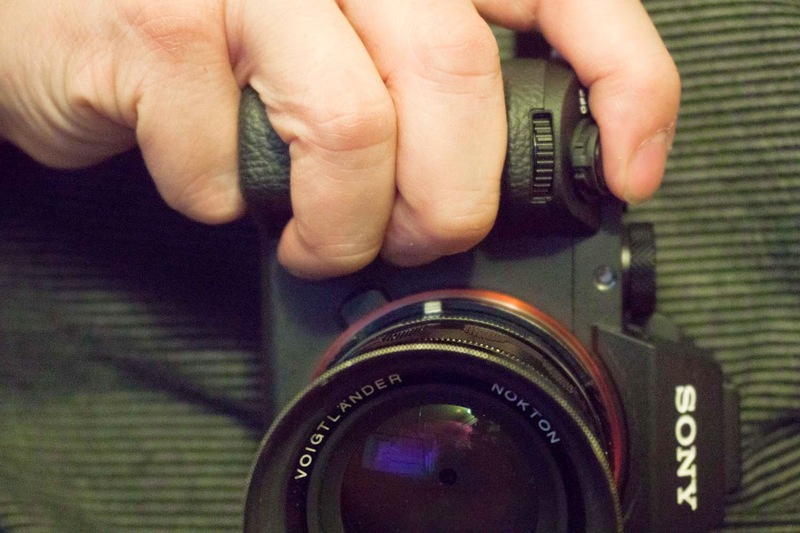 Nikon cameras also have this problem, but with the softer indent dial on the A7II, it is easier to turn it. I recently stopped hanging my cameras that way because of a fundamental flaw in design in all cameras (more on that later). 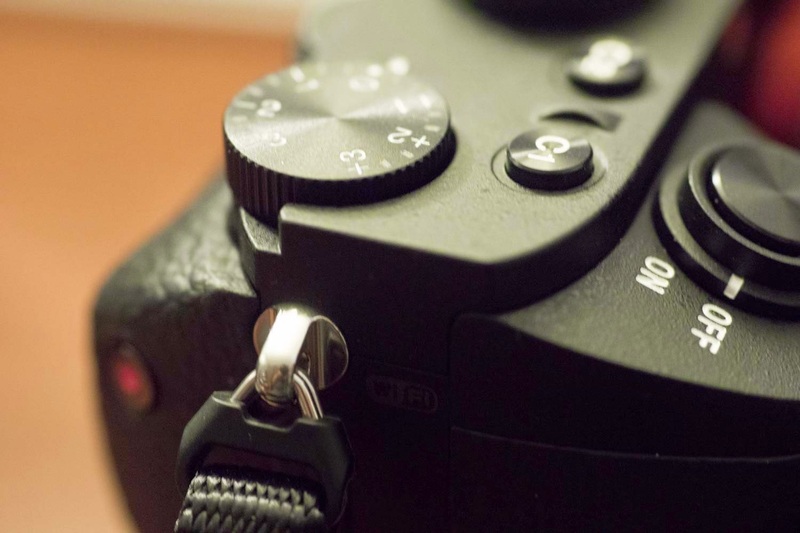 With the relocation of the shutter button, the strap lugs are positioned between the index and thumb. This is a far better position for neck strap wearers and to some degree hand straps. 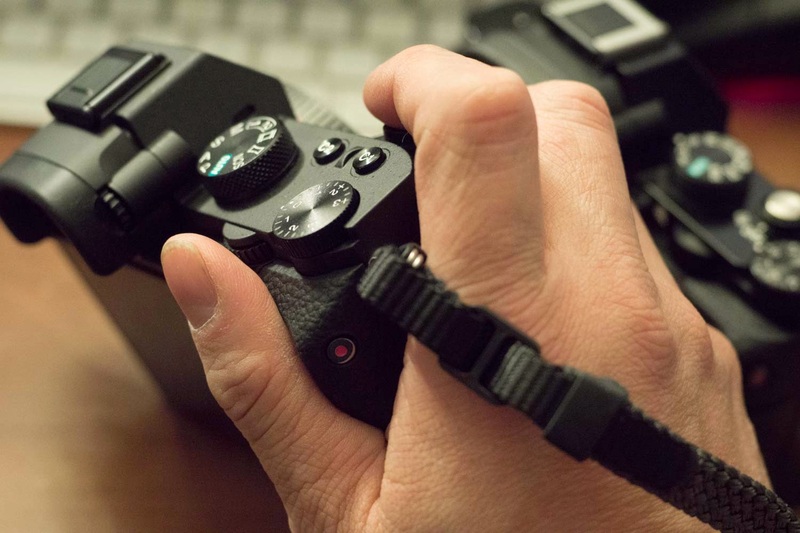 Wrist straps or lanyards can have the strap sit either over the hand, or under the hand. This might be uncomfortable for some. The old shutter trigger button location was very rangefinder like in the A7 location. For those that came from that world, they may have found it comfortable, however those cameras didn't usually have an exposure compensation dial that was necessarily in the way as you rested your index finger against it. The shutter button makes far more sense and is located in the right place now on top of the redesigned grip. The trigger button itself is slightly larger and has less play in the two positions vs the original. This might be both good and bad to some users who, but in my books, much more responsive. Some might call this a more 'spongier' kind of button. 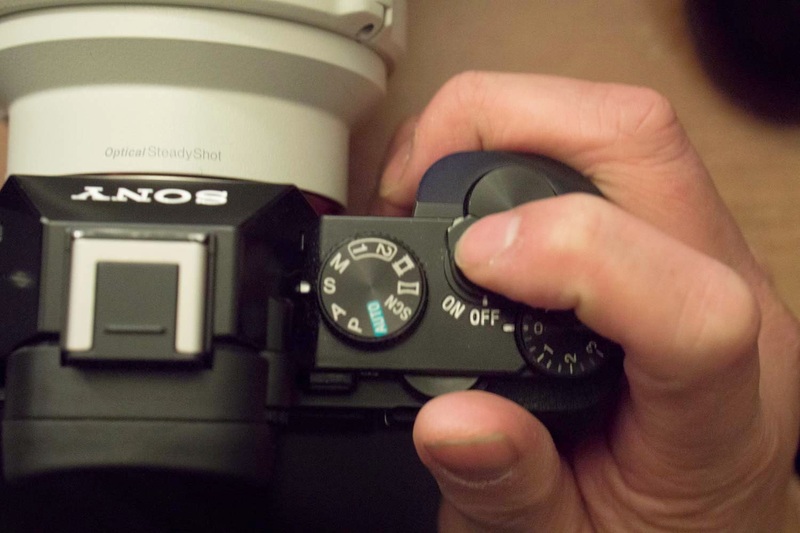 I find that some camera manufacturers make their shutter buttons too loose and it feels unresponsive. This slight adjustment in button design is welcome. Personal preferences will dictate what you prefer. 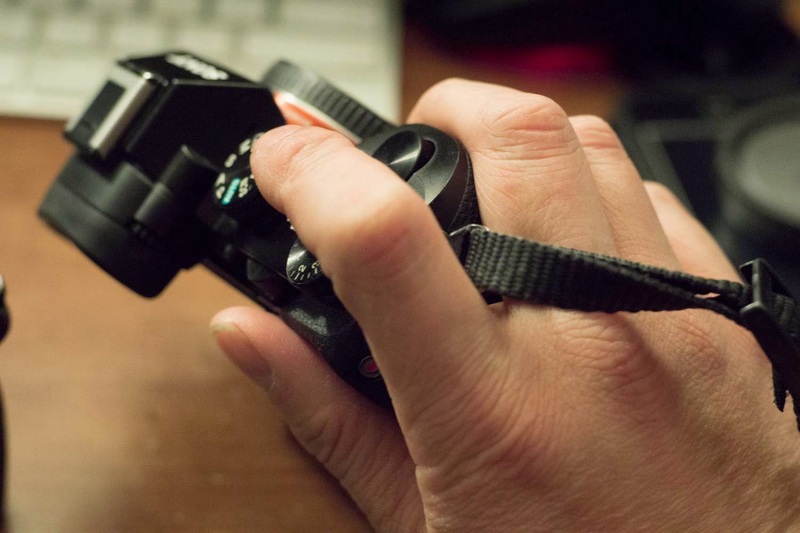 The deeper grip also puts the fingers and knuckles closer to the barrel bevel of larger lenses. Larger fingers might find this a bit close and crowded. 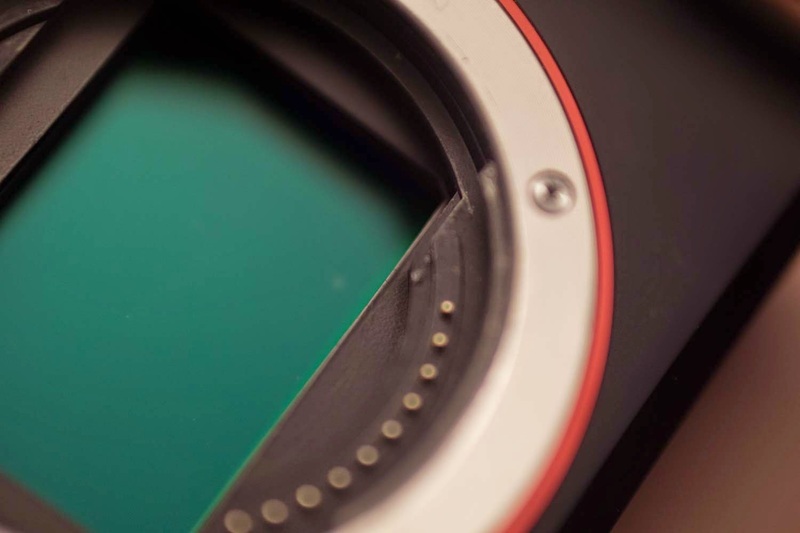 This is a fundamental design flaw of the E-mount and larger lenses. The A6000 is actually slightly closer, but because the face of the grip is shorter, the fingers come back ever so slightly. This is more noticeable when you're wearing gloves. The only solution for users with bigger hands is to hold the grip with their fingertips rather than their knuckles (in this case pinky under the grip, and back corner in the middle of the palm). With the relocation of the shutter button this gave room for two of the custom buttons, C1 and C2. Both of these buttons are substantially higher than the original C1 and located in a logical and comfortable position. The default actions on the buttons are magnifier and WB, but can be programmed for each user's requirements (also expanded in this update). There is also a ridge located between the two buttons which helps avoid mispressing the other button. The custom buttons have a more positive feeling over the previous version which means no soft buttons are needed. But this brings to mind the annoying movie button and also the rear AF/MF button are still too recessed for my taste of usability (these can be improved with a third party soft button). 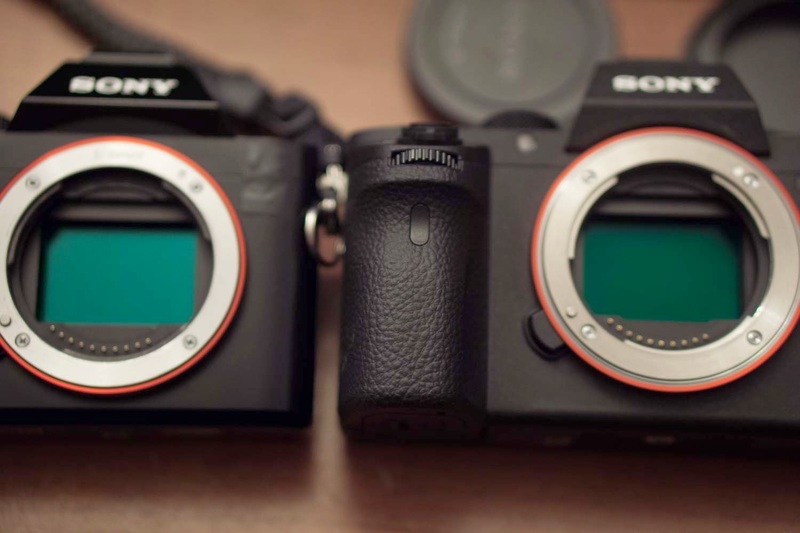 One of the more nagging design flaws from the A7 and A7r is the rear shoulder/shelf. Both the MENU and a C2 button were located on it, but were rather difficult to press because of that shelf (I don't have a big thumb but it was still difficult to hit the buttons with the shelf in the way). Thankfully, the A7 mark II has been redesigned with a bevelled shoulder where a more easily accessible MENU and C3 now sit. The bevelled shoulder also makes it much easier to access the rear dial. However the deeper grip also makes it slightly thicker to reach both dials at the same time. 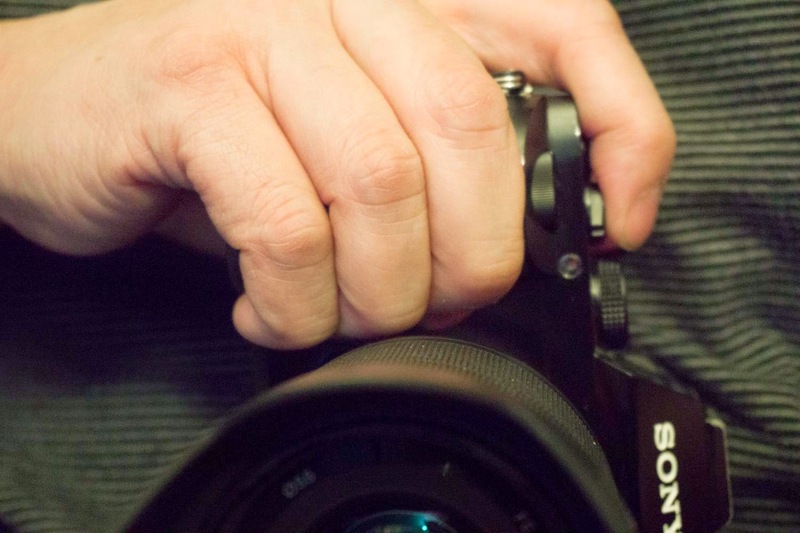 Manual mode shooters with small hands might find this set-up a little tricky. 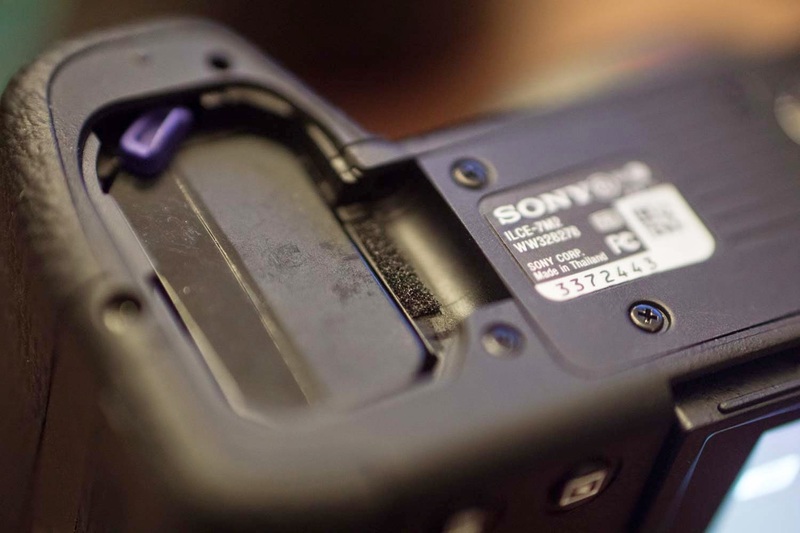 Another redesign to the camera is a much smaller SD memory door. The card also slides in a more logically and new direction. This is partially due to the fact that the new in body stabilization needed more room, but the new door and SD logo facing towards you for loading is a welcome improvement. I do wish it was dual slot instead, but obviously that would certainly introduce all sorts of issues with component locations. The redesigned slot also has some better designed channels that prevents moisture. I also find that it's much easier to access it with gloved hands. 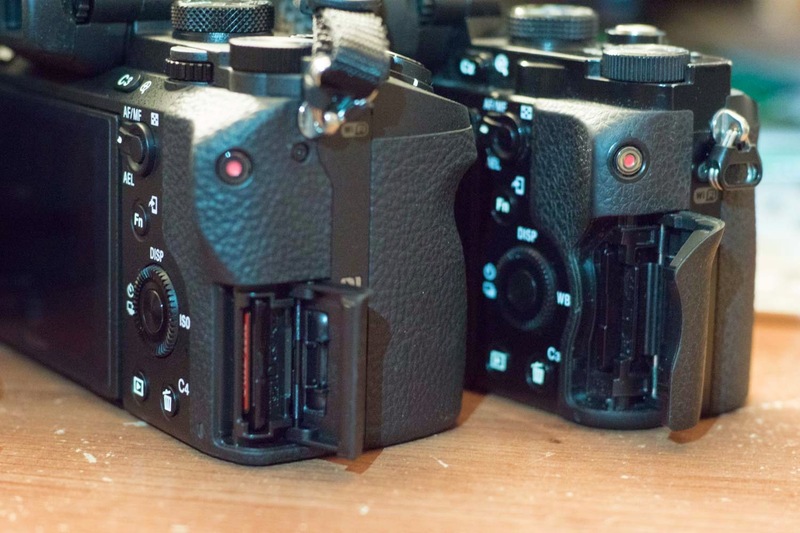 Another nagging issue with the original A7 and A7r design is the poor paint and finish. The corners are far more rounded on the A7 mark II design and unfortunately I can not confirm the durability at this point, I know for a fact that all the sharp edges on the older design wore and chipped very easily (about 2 weeks before it started to wear through). The new hammerite finish has a more durable feel to it, so I'm optimistic about it. Also improved is the plastic front face of the A7 has now been replaced with metal not that it made much of a difference before. It's a minor detail but adds to the overall feel of the camera. What we can't see is a supposed improvement on the environmental sealings but there's been some evidence in redesigns elsewhere. One of the major improvements is the mount. 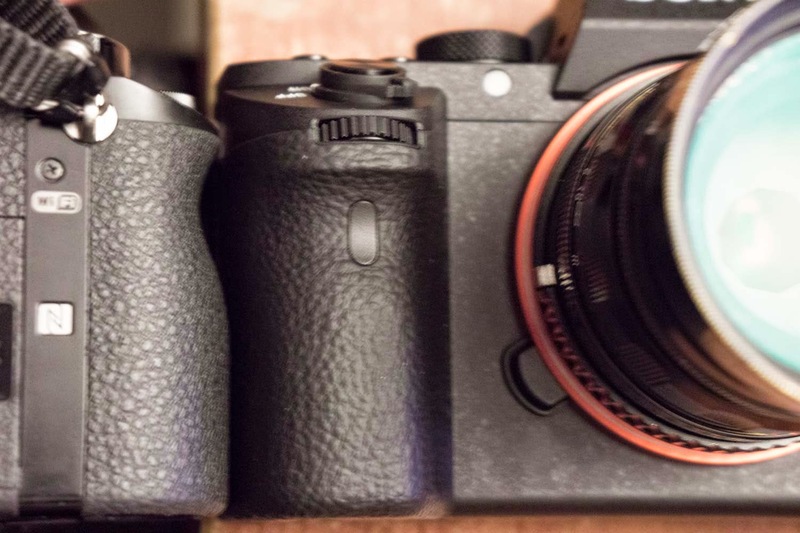 I'm not going to take it apart for my curiosity, but what's different on the A7II is that it's an all metal construction rather than the two piece plastic and metal one on the A7 and A7r. This makes a huge difference on how the lenses feel on the camera. There's no rotational wobble which is very irritating if you have a stiff focus ring and trying to shoot video with it. There is still the usual play that is expected for temperature shifts, but everything I've put onto this mount has been solid and tight. 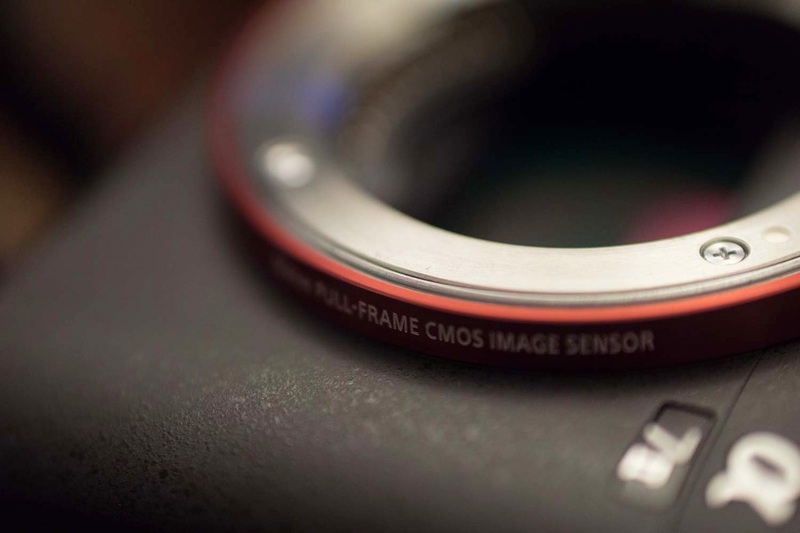 The two piece mount design of the A7 and A7r also introduced a failure point found near the lens release button. Because there is no gasket between the two different materials, it was possible for light leaks to enter into that area (much of this was in specific long exposure and lighting situations). The one piece design corrects for that. I also believe I see a little rubber gasket sitting in what I can only suspect is now a metal sheath just between the orange beauty ring and the mount ring. I believe the A7s has this new design as well, but I don't have a sample to compare. This certainly should provide a lot more environmental sealing, not just from dust and moisture, but any light contamination. While I'm on the mount, inside the mount, there is a baffle mask found just behind the lens contacts. 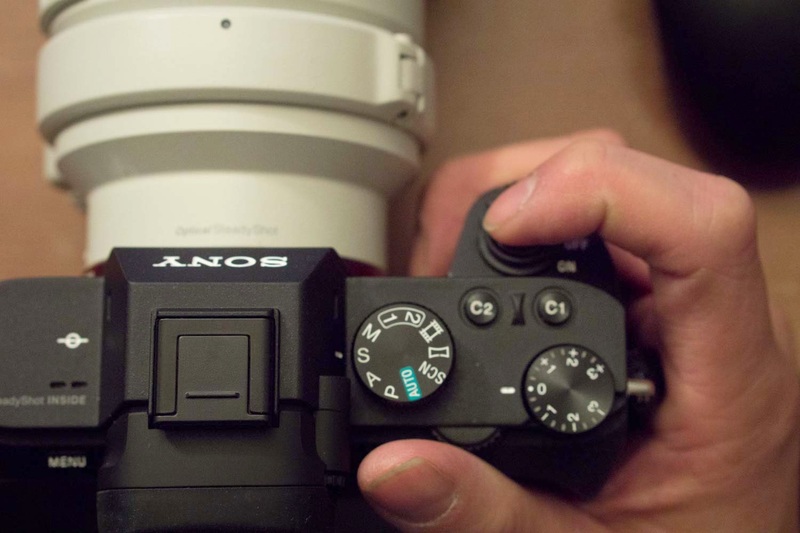 For some reason, the A7II has been redesigned with a slight cutout? I have no real theories at the moment for it but maybe the exception of some sort of flare/internal reflection issue? I don't know why it is that way, but if it does provide some design improvements, I welcome it. 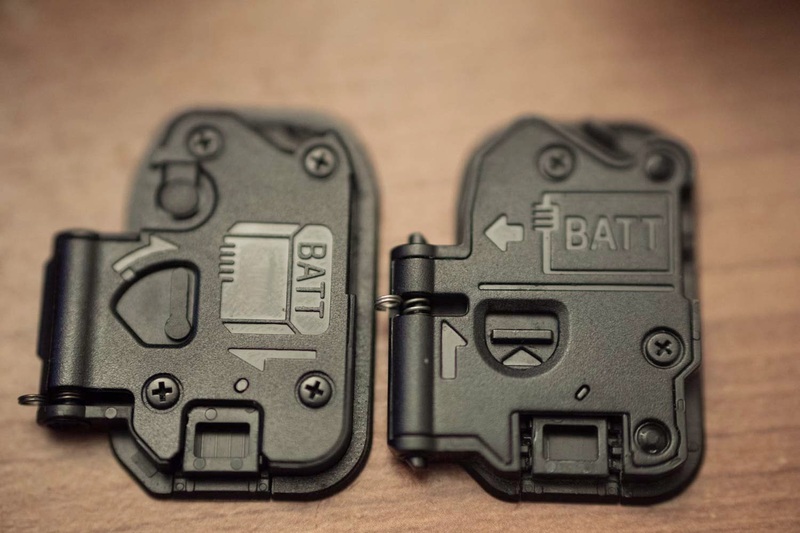 The battery doors have also been redesigned. I'm not completely sure I like the redesign here. At first try I thought it was clever, then I tried to put it into practice which was an absolute pain. On the new design, it now has a lock switch that locks the hinge pins into a retracted position. That seems pretty logical. You can either release it by swinging the switch back, or a tiny little button above it is spring loaded. It all seems rather clever until you try to put it in operation. I found it clumsy and hard to align properly. Although the older design is similar to many other battery doors I've used in the past, I found it far less finicky than the new design. Sometimes if something isn't broken, they shouldn't redesign it. This in my opinion was a poor redesign choice. I should point out that an additional foam seal has been put into the hinge area of the battery door. This brings to mind a warning to everyone the flaws of slings straps. If you think you have a weather sealed camera and using a tripod socket sling system, be aware (from personal experience shooting hours in the rain) that water will likely get into the battery door especially if you hang it from that socket. Cameras were never designed for the bottoms to be exposed to rain coming down on it. However seeing a better seal on the battery door is another good improvement but I'd still caution hanging it upside down in the rain. The rear LCD screen has had a few small improvements. First it's thinner and more embedded into the chassis. I did however find that it was actually harder to flip the screen out because of that. The screen also extends further out than the previous design. This improvement clears the eye finder better so that when you're looking from above, that you can see the entire screen. This redesign also clears any oversized tripod plates that you mount to the bottom. 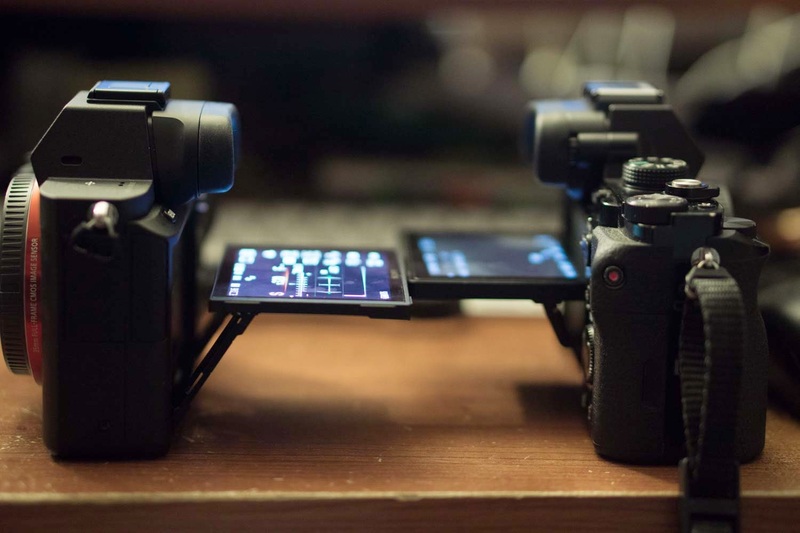 The A7 And A7r screen often fouled with a tripod plate, making it difficult to swing the LCD plate if it overlapped onto the screen. I also believe that there's other industrial design improvements made here. This is also the heat sink area for the sensor. With the more robust XAVC S video, that sensor is going to heat up more. 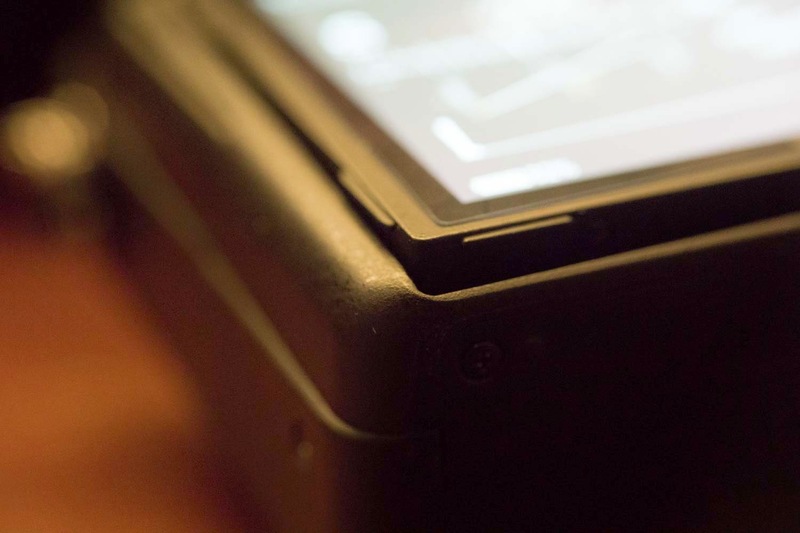 The hinge and greater gaps in around the screen give better airflow. It may be a minor detail, but it might make all the difference of being able to shoot video longer with less heat issues. Another likely change made due to the IBIS added in body, meant the tripod mount is now further forward in position. This unfortunately may be a poor design decision as it fouls the ability to put on adapters if you put on certain adapter plates directly on it before adapter installation. Depending on the adapter plate you may be able to turn it 90 degrees and have enough clearance or add an additional L-Plate with integrated dovetail for popular arca-swiss mounts. New tripod mount location fouling the LA-EA4 adapter when plate is installed. One good thing about this mount reposition is that the weight is better distributed for larger native lenses. For sling strap users this will also put the centre of gravity forward and hang with the lens more forward position than down. Another change because of the IBIS addition, the media ports are now more compact and located on upper portion of the camera near the strap lug. There is also new lanyard plastic doors to cover these ports. They are much cheaper and more plastic than the original doors but I prefer them over the swinging media doors from the A7. They do open near the strap lugs which some people will find annoying. I've never found any media port design that isn't flawed in one way. I like that the doors fold down and away, but personally, I'd rather just have lanyard rubber plugs with well design ports rather than doors. Another obvious wear point is right near the hot shoe. 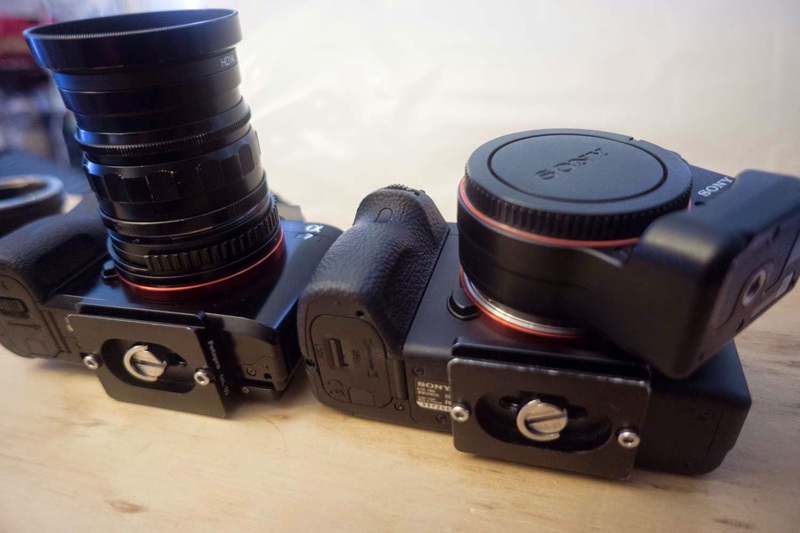 The new design has the hot shoe set with a little more room around it which seems to be less flimsy feeling. The hotshoe rail is now powder coated black like the A6000 but I do notice that there is still over spray on the inner rails of the ISO shoe (I do like the look of it though). In my trigger tests it didn't interfere with operation, but if it does, a little emery paper might be necessary. So there's a little dirty secret that Sony hasn't publicly come clean about. 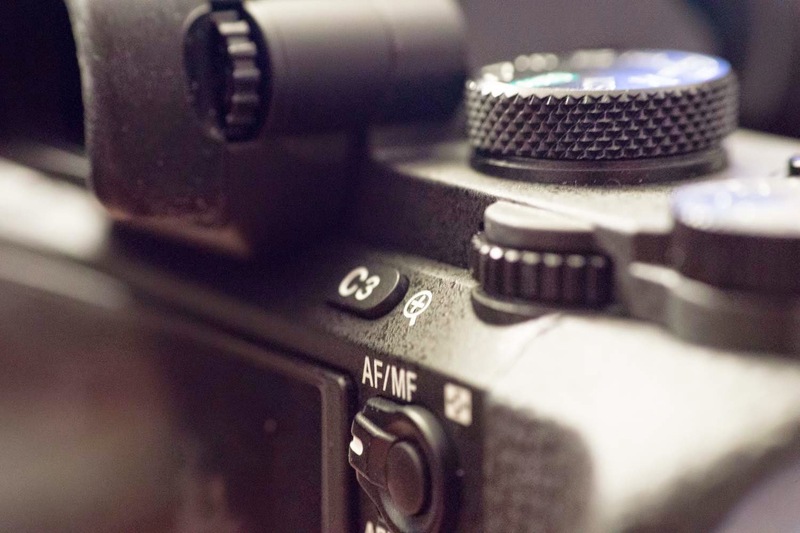 No one knows for certain if the A7 II sensor is a new design or not, but most public information seem to say that it is the same. One thing is certain, there is a completely different coating on the protective glass. The A7 compared against the A7II shows that the A7 sensor in my sample image reflects more off my white ceiling in the sample photo. The new anti-reflective coating on the A7II prevents some incidental flare (and sensor blooming) issues that happen mostly with some third party lenses and most times with point lights (in my cases I see them sometimes in architectural photography work I do). It could be argued that it isn't the responsibility of Sony to put out a release about this design flaw with third party lenses but unfortunately it happens with FE lenses as well. But clearly, they changed the coatings in the new camera to correct for some reflection issues. Further testing is required but regardless of why it's different, to me it is a welcome upgrade. Sony has done a fantastic job of updating the ergonomics on this camera mostly due to the fact they had to make room for a moving sensor. There are still some issues that may never be resolved, or will require a slightly wider design or even a complete form factor change. Overall the ergonomic changes are very welcome to me. The camera is heavier but it just feels right in my hands. 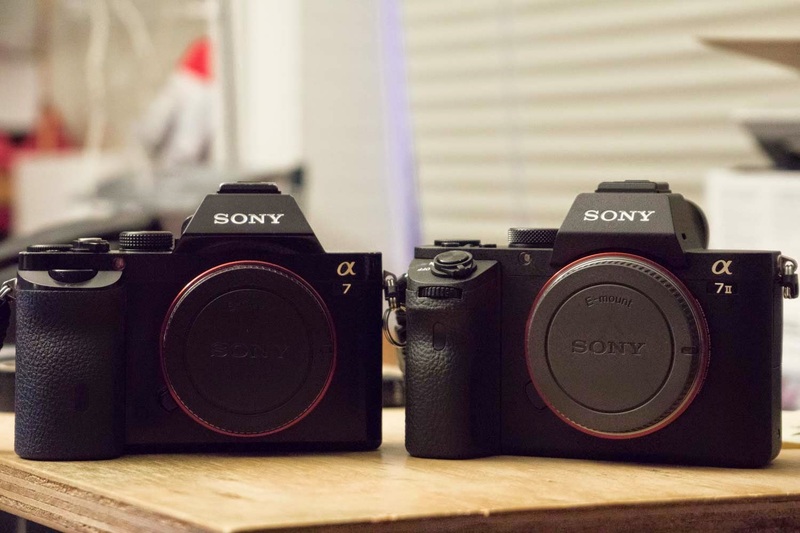 It has a more solid feeling over the A7 and A7r. In some ways it feels like I'm handling my Leica in my hand and doesn't feel like a shell over empty bits of space in it. The new grip is a massive improvement and feels far more secure. The fit and finish overall is better, and the new buttons are welcome improvements. The IBIS is of course a welcome addition and redesign that I hadn't talked much about. It makes all my vintage lenses image stabilized which means lower speeds and better low light performance. That's an important thing to appreciate, but unfortunately it did make it rather difficult to make an ergonomically designed camera. Also apparently auto focus is improved by 30% according to Sony. This is significant, but not part of this review. I've actually not found it difficult to make the AF work on the A7, but I'm sure I'll learn to appreciate the improvement much like I did with the Canon 5Dmark3 over the Canon 5Dmk2 AF. Some improvements will be awkward with really small hands or really large hands, but I believe for most average sized hands, it should be fine. I do believe the improvements do one of the most important things to this update which is making it a working tool, like SLR designs before it, it works very well in the hand of a user. Is the update worth it for A7 users to upgrade? In my opinion, on just these ergonomic updates it can be worth it. But I caution users that have really large hands to handle one before you buy it. It will be those users that will likely find this camera too small for their hands. Thanks Greg. You got a comment in. I had some problems and needed to fix the comment section. Truly great review! Any chance of a comparision between the A7r and the A7r II? Not just yet. Hard to get my hands on one at the moment. If I do get the opportunity to, I will post something.